I wrote this in August as a reflection from my Summer. Still rings true to my head and heart. Is still where I seem to find myself months later. Praying this would be my stance in 2018... as I walk into a New Year I am praying I walk expectant, eager, and excited for what will be! Envy can so easily be my default, but Lord would YOU Come, invade my heart, and help me to SEE You! Cheers 2018!!! Can't wait to see what you hold!!! Malibu Club, a Young Life Camp in British Columbia!!! A place that has become Very dear to me over this past summer and fall! Oh Tomorrow, Help me to trust. It got too easy doing… it got too easy in the details. My God... He brought my heart back to Himself. All my buttons got pushed. The funeral processions and shouts of celebration! Today, it can all belong. The perfect, the simple, the mess, the surprise, and the doubt. I can trust in one moment, and in the next throw my hands up. He is still holding me. In every corner looking for His glory to be revealed. Oh Lord, Help me Look! We have a God that can handle our Whys! Who can stand in our mess? Who can, in each turn, pick us back up? Who can KNOW us all and LOVE us ALL? Praying today to stand in Holy Mystery of the ONE who IS! Praying today to trust, to believe, to wonder, to KNOW! Praying today that He will sustain, speak, and soothe! Each December I feel like the Lord gives me a different way to be captured again with the Christmas Story, to marvel at what this season means for us, and to TRULY be reminded of the JOY that Jesus came to be WITH US!!! This year, it is the Wise Men... I was driving home from an appointment last week... This weekly meeting usually leads me to think, pray, and lean more into Jesus!!! This weekly appointment is a place where I can be raw, real, transparent and vulnerable. And typically I drive in silence on the way home to process what was said, and what I heard. Last week, however, I felt prompted to turn on The Message Channel on my Sirius Radio, which for this time of year is unusual because I am faithfully listening to Holly Channel from now until when they take it away from me... Haha, I LOVE Christmas music! As I drove this song came on the station... Familiar to me, and reminds me of my Dad... so does "Good King Wenceslas"... That's another story! Okay, maybe all Christmas music reminds me of him in a way where comfort and memories flood my heart. But as I listened to this song tears formed... slow, but the type of gut tears that I didn't have words for until I found them falling onto my blanket scarf gently, but with crushing truth. And I belted out the end of the song as loud as I could. I remember Ruth Haley Barton saying, "Tears, sometimes the souls way of saying something before we have words for it." And for me last week, that was true! "Oh, I'm gonna need, some perfect light"
"Let your light shine, let your light..."
"Gonna Need some Perfect Light... Oh, I need it..."
Over, and Over it echoed in the car and in my heart. Oh Lord, YOUR Light, your PERFECT Light. Over the past year I have really been struck with the image of light and darkness... with God's light Shining! Our Lord has the ability to SHINE... and shine He does!!! And Shine HE DID for the The Wise Men... Following the Star to the Light of the World, to His Perfect Light! The journey... the effort... how tired, how hopeless at points, wavering, trusting, and forever believing. I went home and started to look up all I could about the Wise Men. One commentary said the journey would have taken them 25-30 days, following a star. I mean... COME ON! 25-30 days following a star, but together they pressed on. They wanted to see, and so while their journey would have been difficult at times, they were determined. They knew the promise, they knew what they were after, and they BELIEVED He was BORN! So they ventured on. With gifts, and such hope to stand before Him and rejoice, the King of the World is here. Can you imagine being one of the Wise Men, searching on their journey for THE Perfect Light. What they must have felt when they arrived. The pace of their heartbeat, their souls at home in Perfect Light... A King before them! I have thought a lot this season about where I am merely chasing any light, anything that shines, sparkles or glitters. Anything that makes it feel just a bit better. Something that makes loneliness feel more tolerable, or makes me appear more beautiful, more on the right track, more hopeful, maybe less scared, less unsure, less critical, and less sensitive. And yet, how quickly that fades, how it dulls, and we forget. And we begin to chase something else, anything deemed greater, with more sparkle and shine. I have lived a season this past year FULL! It was FULL with so much good I can barely stand it... God's favor showering like stars in the night all around me. I would not trade it for anything, and I do mean that. It has been an incredible year, watching God work. But my gosh friends, that does not mean there are not moments where it seems to unravel. Where it feels like there is more dark to be found. Where I wonder what has happened to the light. Where I constantly wonder am I okay? Is this right? What do they think? Why am I so selfish? I think I need a nap! Haha! The evil in the world, Lord come quickly! How do we put it back together, the broken, the sick, the relationships... And when I find myself in these moments, the sparkles start to be so tempting. The temporary. What every voice is telling me to do, to say, to be. In those moments, I don't want to be determined anymore to see the Perfect Light... it feels like any light will do. The Light I can follow. It is actually the ONLY thing I need. The Light that guides. The Light that leads. The Light that KNOWS the journey, and the destination. The Light that can never lose its sparkle... It cannot dull. It refuses to fade. The Light that is constant, forever. AND the Perfect Light that shines in the darkness, in the questions, in the uncertainty, that cannot ever be anything but completely Perfect! Lord, Let your Light shine. Lord, your Perfect Light. And isn't that part of why this season seems so magical. All aglow with twinkle lights, and candles, but really it is His Light that is WITH Us this season! And not just December 25th... when the icicle lights and glittery bows are packed away, His Light continues to Shine! In every moment of every single day. In every question. In all the wants and desires. In the chaos, the disasters, the pain, and the moments where His Light is all around us in an undeniable way! His Light, His Perfect Light guiding us BACK to HIM! This season, I don't know about where you find yourself, but I need some Perfect Light. I need some Perfect Light to follow, to chase, to cling to, and to journey towards. I need some perfect peace, and some more of His Holy Light radiating in the places where I feel broken and confused more than whole and put together. Like the Wise Men, I am determined to find the Perfect Light! And when I get that glimpse, that fleck of sparkle and shine, when I see it so clearly whether in time with Him, at a store with a clerk, conversations, silence, and laughter... I say to Him, "Lord, there it is... there you are... your Perfect Light breaking the darkness!" Lord, Help me follow YOUR Perfect Light. Hope, come close. Oh, How we need it! I was on a flight a few weeks ago, and these words echoed through my ears as I flew from Detroit to California. My dear friend Courtney introduced me to May Erlewine, seriously years ago now. Recently I have been part of some large and small conversations… internal pressure, external dialogue, words, feelings, questions, and so many thoughts. All of these conversations different in nature, but all significant. Conversations it would be easier to avoid. Conversations in my pit I get nervous about. Conversations that hurt, that feel freeing, where the outcome is uncertain. Honestly, conversations that if left unsaid might be easier to live with. Because they are unpredictable. And unpredictable is scary. It is hard. It is vulnerable. As a creature of habit, I hate unpredictable. I avoid unpredictable. Conversations I could keep hidden, I don't NEED to have, conversations that make me more exposed and transparent than covered and collected! Here is what I have learned about difficult conversations… Have Them! Plain and simple. Have them. Have them with yourself, with others, with trusted friends… Seriously, Have Them! Even when your heart is beating out of your chest, when you realize you cannot predict the outcome, when you feel slightly crazy, but 100% HONEST all in one moment! What I have realized is that avoiding leaves room for wandering thoughts. Avoiding allows for shame, for insecurity, for more questions than answers. Avoiding keeps us captive, keeps us wrapped in the darkness of what ifs, keeps us questioning, and keeps us isolated. Keeps us TIED to our idea of control. I am grateful for truth I know today because of these conversations. I am thankful to know where people stand. What boundaries I have to put in place to keep me healthy. Where we are taking root, where glimpses of light have been ushered into dark places, where truth is revealed, where I am growing. For me, fear can drive so much of what I do, or not do. And fear is rooted in hard conversations. Fear of what the other person will do, think, or say. And truthfully, I want people to like me. I want to be friendly and fun, and all sorts of Awesome. Haha, don’t we all?! BUT my friends, the fun, friendly, all sorts of awesome me is sometimes judgmental, can get easily hurt, and is unsure of what is real. The fun, friendly me can do mental cartwheels to figure it all out. The fun, friendly me, can be rooted in fear, and can get VERY tired from this fear and isolation. BUT today… the me who has hard conversations, who welcomes pain, who grows from situations I wish were different, who likes to hear “Can we talk,” is more me than the 10-years-ago-me. It is not easy. In fact, there are many days where I wish I could re-do, where I have messed up, and conversations that I would love to have played out differently, conversations I wish I would have had earlier. BUT today my God is bigger. Bigger than the mistakes I make. Bigger than the dream I have of who I should be, or where I should be in my life. Bigger than expectations and fear. Bigger than uncertainty! 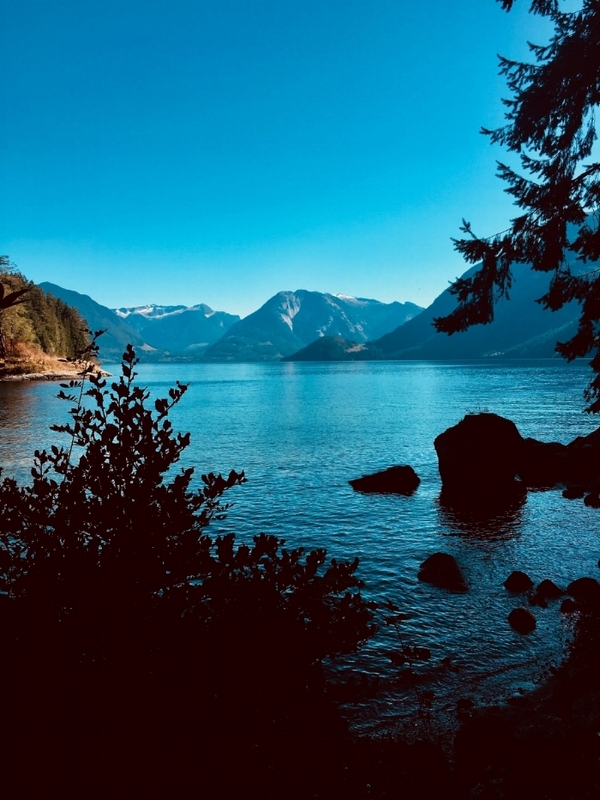 As I flew to California and heard May's voice ring through my ears, she says, "It is not easy growing out of small things"… I thought about the beautiful sunrise I saw in Kodiak, Alaska, this fall. I stood on the beach and watched the sun rise, and it rises for a very long time in Alaska. It seems like a million small seconds, minutes, until the glory is revealed all at once, and the sun finally breaks and rises. Out of darkness BRILLIANT lights. Yes, the SunRISE. It is possible because it breaks the darkness with glimmers of pink, yellow, orange… In the slivers of pitch black we see LIGHT! Small fragments of light, that turn into glorious colors all because it broke through the darkness. Hard conversations are like that... moments of His glory in darkness. Words of truth that shatter the darkness, the image we have created or set for ourselves. The reckless abandon to His Light, His Love, His Truth... THAT ushers in the ability to REALLY See, to Speak, to Live! One of the most beautiful sunrises I have ever seen in Kodiak, Alaska! Lets continue to break the darkness with His Light and with His Glorious Love! So whether it is with friends, family, that relationship you are not sure about, work, envy, pressure, comparison, lies... lets start spreading those BIG wings. Lets take flight friends. Lets grow out of small things, small moments, small conversations, small truth. Where we tune our heart and mind to the Sunrise. Knowing, the darkness does come before the sunrise. It has to. Broken fragments of light in dark places. Today I am BOUND for the sunrise. Bound to be more me, to glorify Him. I am bound for the sunrise and not the darkness. Captive to His Truth, to His Light. Where I cannot fail or fall. Where shame is not allowed. Lord, I am ready for the sun to rise. I am ready to be bold. I am ready for you to shine in small things, in dark places. Ready for you to CHANGE me. Lord, I am ready to see you shining… and I want to get brighter all the time because of YOUR light. Lord SHINE your goodness in the broken, hurt, dislocated parts of me. Lord… as things change my prayer is that you would be brighter in my life all the time. Lord, I know with you and through you I am BOUND for a Sunrise!!! "For the light makes everything visible. This is why it is said, "Awake, O sleeper, rise up from the dead, and Christ will give you light." Sun still rising in Kodiak! Somewhere along the way I stopped breathing. I don't know when it started, but trust me it happened. I don't even think I was aware of my non-breathing. Well, that was until I went to my first Yoga class. About a month ago I was invited with our Regional Young Life Women to go to Yoga. I knew the day would be oh so fun with these friends... And I was fairly certain I would laugh out loud trying to do the different poses. Okay, I KNEW I would laugh. And I would fight the laughter because Yogi's don't laugh which means I would laugh ALL the MORE... See the issue?! And I was fairly certain this would be the case because my friends Annie and Lindsey tried to show me how to do Yoga one time, and it was mainly just me giggling and watching them! So, I got my outfit together... a key step... and felt pretty confident that I was as bendy as I was in High School as a cheerleader. I mean, I can still do the splits so that should help at some point during the Yoga experience, Haha! I even looked through my cheer photos to bolster my confidence... Truth! Well, laugh I did... Especially during Happy Baby Pose... It's the Best! I can't believe that is something someone is asking me to do... Look it up! It's Amazing! But something unexpected happened. I breathed. I mean like really started breathing. Now, I know I am breathing every day, but honestly there is more swirling in my head than I care to admit. My friend Emily told me during a conversation that even her thinking of how much MY brain is thinking, going all the time, makes her tired. Haha, Whoops! Mental hula hoops is my specialty! But the invitation that day at the Yoga Studio was to notice our breath. That is the very first thing, sit and breathe... And notice I did. I don't know when I stopped noticing, but it had been awhile. A long while. I got busy. I got nervous. I got uncertain. I got scared. I got consumed. I got going. I got moving, and didn't look back. I stopped noticing. I stopped being. I stopped breathing. I stopped checking in. I simply stopped. It felt effortless to stop because I was clearly still breathing, but stop I had. Stop I did. I had stopped breathing, stopped noticing, stopped reminding... Very simply stopped. And instead of breathing, I was inhaling. Without even thinking! It felt like breathing, but it was very different! The invitation to breathe was like a fresh offering for my soul, my heart, my head, my body. Like someone was ushering in a parade of confetti, balloons, fresh cut flowers, Christmas morning, and doodle dogs in each sweet, small breath... All my favorite things in one very simple breath. Sit, Breathe. Pay attention to the Breath. Then, during the whole Yoga class the invitation was not to compare to the people next to me, to master Yoga, but to be with my breath. And for me to be with the Lord in my breath. Simply my breath and me. For ONE hour I got to breathe, to stretch, to find strength, to BREATHE even deeper, and to Move WITH my breath! Ohhhhhh LORD what is this magical Yoga???!!! And so NOW... Friends, I am into it! I am really into it! Haha!!! AND I'm breathing again. And I'm not good at it. And I laugh at myself when the instructor tells us to lift our left leg back, and then with one solid motion plant the left foot for Warrior 1. I can't do it yet, I stumble, shift my foot... It takes me like 5 steps! Haha, but every time I giggle, I breathe, and I feel such a passionate gratitude. I am with my breath. My breath and me... Me and the breath the Lord is giving me to me! Giggles, Warrior 2, Downward Dog... All while breathing! My Hair Post-Yoga!!! Bahaha, it wouldn't move and it made me LAUGH!!! Friends, I want to breathe. I don't want to inhale all that is around me... I want to breathe. And not just at yoga, I want to breathe deeply during the day. To acknowledge the Lord's presence in my breath yes, but also in my very life. To know that during the day, while I am moving, going, working I am also WITH the very one who is GIVING me life! Offering me this breath. How is it with you today? How is your breathing? What are you merely inhaling? Have you stopped to breathe deeply the truth of WHO you are? That our God is giving you the VERY life you are living, the very breath you are breathing... Breathe in today your value, your worth, your goodness is FROM Him! That while we are busy, experiencing loss, challenges, uncertainty, pain, we are also breathing in HIS Goodness, His Presence, His Life! Our very Breath is His!!! Has it gotten overwhelming? Are your mental hula hoops taking over? Stop. Sit. Breathe. Maybe do Happy Baby Pose... OR just lay flat on the floor... FOR REAL a Yoga Move!!! Haha! I'm telling YOU, I love it! It feels good to breathe again, but more than that it feels good to be firmly planted in Him. In His grace, His goodness, His unending love, His presence... It feels sweet to be WITH Him in my breath! AND to know I don't have to hold it all or inhale it all. I am breathing again... I don't have to figure it out, IF my very breath is His how much more is my God in control of ALL things! How much more is He ever gently WITH me, FOR me, and SEEING me. My breath is His, my life is His! So, to you dear friends I say, "Namaste"... Or under my breath I always say, "Amen!" Haha, but don't tell my Yogi Friends!!! Snow flakes dancing, finding the perfect spot to fall... such beauty. The smell of an Oatmeal Cookie Candle... such warmth. Snoozing Doodle Dogs... such sweetness, and yes lots of fur! Ah, Thank You Lord, this home. It is good to rest here awhile. I have 5 different blog posts started, which is very unlike me... but do not feel like any of them have direction yet. Nothing simple. Nothing put together. Have you ever felt like a mix of many things... Pieces are jumbled, nothing is landing smoothly, and all the while moments of goodness. My mind continues to wander and wonder, my heart is full but a flutter, and my soul achy for Jesus and His sweet presence. A mix of JOYFilled moments where God is SO clear, and heavy conversations where heartache takes up all the empty space in a room, and leaves longing to linger. Today I simply decided to share my prayer from this morning. Nothing extraordinary, challenging, or amazing. Only Truth, abiding in Him, and with Him. Praying this Today for Us. Praying this Today, knowing He stands with Us. Praying this Today, trusting We are Known FULLY. Praying this Today, Believing He is ALL We NEED. Holy Presence, Holy Tears, Holy You! and carry them in your arms forever." All things aglow. Glitter, bows and twinkle lights. The perfect shade of hunter green against a delicious candy apple red, all hung with great care. But I would argue for so many I love, the past week has been anything but Hope, Joy, or Love. There has not been much time for admiring glittery ornaments, or the sweet shades of green and red. Instead, this time of year has met them with growing problems. There has been Pain. Grief. Heartache. Loss. Sadness. Cries for help. Cries for God. Cries of Anger at God. Questions. Tears. More Tears. Unimaginable Weeping. And I reply, Come Lord Jesus, Come! I want the Lord. Now please... if I am being totally honest. Recently, I have found myself in moments of prayer or conversations where I have no answers. I pray, cry, my heart breaks for those I love, and I pray again. I have found myself continuing to go back to the words of "O' Holy Night." The verse I am drawn to is, "The Weary World Rejoices." Life at the moment, feels weary for so many people I love. Why then would a weary world rejoice? In the midst of chaos and pain where are we rejoicing? Why are we rejoicing? When I look all around and it seems that life is not as it should be... the act of rejoicing seems an almost impossible task. To Rejoice? In our weariness, our pain, our suffering? I watched "The Family Stone," on Saturday Night. Drank red wine, addressed Christmas cards, snuggled with Mason and Milo, and continued to cry. It is one of my favorite movies... A family returns home for the holidays, and their mother Sybil Stone is sick with cancer, cancer that she has beaten before. The movie shows the complexities of family, the dynamics of feisty siblings, and opinionated parents. There is great moments of laughter, and so many moments I find myself welling with tears. It does not dwell on Sybil's sickness, actually is never really mentioned, except for a scene with one of her sons. Here is what Sybil says when she opens a gift on Christmas morning, given by Sarah Jessica Parker's character Meredith. Sybil Stone: Me and you. That's Me and you. It's Me and You! IN a weary world, where hope seems lost... It is Me and You says the Lord. Weary ones, We do Rejoice! The promise this season is not magic, not twinkle lights, and all things wrapped neatly with bows. No, the promise is that God came near. Immanuel, God WITH us! He has not forgotten us. He has not looked away. He is not sleeping. He is present and with us. That is the promise... Me and You, kid! I think about Mary... my goodness how badly she must have wanted to know how it was all going to turn out. How weary her situation must have felt. How she must have pleaded for God, to get it. To understand WHY it was all happening. Pregnant, engaged, so very young, angels speaking, leaping babies in bellies... How scary. How messy. How mixed up. And like the song says, It is divine. I wish we could understand divine. I wish we could gather all the evidence, and in some small way "get it"! Get what God is doing here on Earth. Understand why things happen, where God is, what is going on. But it is a Holy, Divine, Big, Powerful, Mighty God who dwells with us! And that is not our promise, to understand... OUR promise TODAY is that He is WITH Us... ME and YOU!!! Me and You! WE are never alone. Much like a woman who is pregnant for 9 months WITH child, our God cannot... Will not... Separate Himself from us! How much more then is He is WITH us! To my weary world... God is STILL God! Rejoice that He is with you, stands next to you, grieves with you, hurts with you, cries with you. Yes, God is present in your suffering and in your wondering. Weary Ones could we rejoice today. Rejoicing that our Home is not here. That our God is coming. That we are not forgotten. Rejoice in the Sweet Promise, Me and You... unbroken, forever, in it all... Me and You!!! Oh, how Divine and Holy He is... Oh how precious is the promise. Weary Ones... He is WITH You! May Jesus Himself drawn near to you, and whisper sweetly, "Me and You, Me and You!" wherever you need to hear that PROMISE today. And as the song goes, "For Yonder Breaks, a New and Glorious Morn." That is what we are promised. He doesn't say when, or how, but we are given through His presence a new and glorious morn. Weary hearts, hope on the new and glorious morn. He will come. He is coming! He is OUR Hope... Me and You, Me and You, Me and You!!! One of my most favorite ways "O'Holy Night" is sung... SNC!!! What my Petting Farm Reminded Me!!! We pulled up to the driveway, and the only thing I could find to mutter was, "Do they have a horse?" I was SO surprised... SO Surprised!!! That's right, one llama, an alpaca, a sheep, goat, baby bunnies, one guinea pig, and a horse named Apache, greeted me in my friend Beth's driveway for my Birthday Surprise! This is what a 2 month old baby bunny looks like!!! Haha, I was given a petting farm this year for my Birthday. Yep, a petting farm and a pony ride! Was I turning 5 you might ask? Nope, 32 this year! . Who would think of this? Who did this? Well, meet my 240! I arrived last with Lindsay. We drove from Nashville to Worthington, Ohio, in the pouring rain, and at this point I had been away from home for 13 days. We were greeted at our Bed and Breakfast by the cheers and hugs of our 5 other Spartan Sisters! It's the familiar 240 Love. All 7 of us lived in a house together at Michigan State... our address was 240 Oakhill... Hence 240 Girls, 240Love, 240 Friends. We are 240!!! These dear ones, gracious, sweet and spunky sisters of mine are some of the most treasured relationships I have. They embody faithfulness, live intentional stories, love deeply, are passionate, trusting, adventurous, incredibly generous, and make me laugh harder than most... We have history, we tell truth to each other, know quirks we wouldn't dare share, tell memories with gusto, and celebrate each time we are together! My 240... My Dear Ones... Audry made this before our reunion this year, and I loved it! She said, "They are no fun at all!" Haha, Too Cute!!! Annually we meet for one weekend, and while the destination changes the rhythm is the same. Give us laughter, truth, time to be together, wine, strong coffee (or iced tea for Kristen), a place to lounge and no real set schedule... We don't like to "HAVE" to be somewhere. I was tired this time, but absolutely elated. In this group of dear ones I can merely be. Show up, as I am. No expectations. No pressure. It feels magical... like a separate space in time that is set apart to be 240! The roots run deep, and the memories still very vivid and alive from over 14 years of Friendship! We are Valued. Different, yes, but cherished just as we are. With these ones I can be simply me! On Saturday morning, I felt like I was drinking in the environment. Talk of new babies, almost ready to make their entrance into the world, and expert Moms with advice and thoughts to support. I am amazed at watching my dear ones have their own families to raise, to love, and to talk about. I listen intently as their voices share openly about what God has given to them through children, travel, husbands, jobs, disappointments, relationships, questions, and celebrations. I am amazed by them... all 6 of them! Amazed I get to share in this life with my Spartan Sisters. Talking Diaper Bags with Spike dog!!! I can be quiet with them. I can be still, and just listen. Their laughter is so familiar to me, and I find my heart leaping with such gratitude for these sisters. I would catch myself on Saturday surveying the room with a deep love for each of them. It is a real blessing to be together. Special. And I want to remember every detail. I want to be present. Present to what is offered so freely in this space, and given with such ease! We spent Saturday sipping coffee, slowly getting ready, and laughing. There was adventures to a market, the conservatory, champagne baby shower, and a wonderful slow dinner. We laughed and drank wine at the Bed and Breakfast until late that night. It was perfect. Sunday morning we woke up slowly... I heard Krista say, "I want a week of this," and that made my heart smile big. Me too... Me too! We ate delicious pancakes in our oval dining room... Vegan for me, and SO yummy. We had packed up, and were on our way to see the new Baby's Room at Beth's house. Completely shocked, totally authentic, Genuine JOY. I could not believe it. Truly, it took me about 20 minutes to gather what exactly was happening. Yes, Beth and Emily orchestrated a surprise for us all... They are the greatest masterminds and can make just about anything a reality I am convinced! I spent an hour at my very own petting farm, riding a horse named Apache around an Ohio subdivision, petting the animals, opening presents, eating a vegan cake, and crying... LOTS of crying! BUT what continues to strike me the most when I think about that day is that, I am known. I am really and truly known. I have thought about why that would surprise me. I'll be honest... I think there are moments where I find it quite easy to forget I am thought about. Doesn't that sound crazy?! That others think of me. It blows me away. I will wonder on some days what I offer. Or some days try with all my might to see how I measure up. I will want to be different other days, there are things about me I would change every day. I can get very upset with me on certain days. And yet in spite of all of that mental hula hooping, by others I am still thought of! My dear ones reminded me how precious it is to be thought of, and thought of in an extravagant way!!! To be loved. To be surprised. To be known. To be given the exact moment of glee you never knew you needed, but don't want to end. To experience abiding joy that is freely given. I am known. AND YOU ARE KNOWN! Yes, that is true for you. Even on days when it does not feel real, or you don't measure up, or you want so badly to be different. My goodness... our Heavenly Father thinks of us every moment of every single day... with a forceful, never-ending, unwavering, treasured LOVE! We are known. We are loved. We are thought of in ways that make us ugly cry by a God that NEVER stops thinking about us!!! He seriously never stops! My hope would be today you could think of those that love and know you... Thank them! Remind them how special that is, how dearly precious on this Earth to find a person or people that remind you that you are Known! But my biggest hope would be that you would also cling to the ONE that knows you... All of you! The very soul of you! The one who made you and declares YOU are, Tov Meod! YOU are the Best of the Best of the Very, Very Best!!! The very details and fabric of your life He has prepared and is working for good for you. The one who has never stopped thinking of you, seeing you, constantly giving you gifts, and loving you in a way that if we understood it completely would make us cry an ugly, double chin way. Our God offers joy that abides, despite all that swirls around us in this broken world, because we are known by Him! Through ugly crying and explosive laughter I am reminded that I am known. And Friend, so are you! 240 with the Farm! Even Farmer Steve, Beth's Husband, made the day extra special by dressing up in overalls to greet us! Thank you 240 for reminding me. For showing me. For loving me... a glimpse of His goodness in the land of the living through you! Until next time... I LOVE YOU!!! I LOVE Popcorn! I mean like LOVE! I am up there with Olivia Pope... Scandal anyone?! Haha! Especially when I am done speaking or doing something up front. I eat a BOAT load of popcorn. Like LOTS of popcorn. I just sit in a dark room, and I eat popcorn. It's true! I lay down, and just consume popcorn. Haha, I don't know why exactly, but it helps me focus on something else then the constant evaluation my head wants to have. I am able, in those popcorn devouring moments, to give whatever just happened to God, to stay quiet, to pray, and to eat! Did I mention I eat popcorn? This is my FAVORITE kind from Trader Joes!!! Yes Please!!! I took this picture when I was at Timber Wolf to send to my Mom!!! Haha, I need MORE Popcorn!!! I have noticed more lately this mental tug of war I find myself in. This questioning. This uncertainty. This evaluating stance. And I will be honest, I hate it! It plagues me in the back of my mind. Some days are harder than others. The answers vary from person to person... nothing, something, yes, no, not today, not enough, maybe, better next time, needed more, didn't bring the A Game! The TRUTH entering into this Fall Season... I will fail! In fact, I am going to fail! As a YL Staff person, as a friend, as a leader, as a sister, daughter, speaker, program teammate, listener, dog mom, neighbor, roommate... I am probably failing right now at something or many things. There are so many opinions, thoughts, goals, ideas, and voices. I have decided recently, it is too much for me. Truly, this can be all consuming if we let it. Mental cartwheels our thought life can be plagued by... And it is tricky because no one else needs to know. We can contain this, keep this to ourselves. And now, I have to say no more. For me there is ONE voice... who declares my Victory. In fact, I have the Victory because of that one voice. There is one voice that declares me His. That voice Screams, "FREEDOM!" It does NOT scream Failure. This summer taught me many things, but one big thing God has offered to me is the sweetness of His Freedom. So often in my own life I want it all to be perfect. I want to get it right. I want to make sure I am enough. BUT in Freedom, in my life hidden with Christ... the cartwheels cease. Everything in the world is SCREAMING for me to stand firm, to hold it together, to pretend... Well Friends... the One Voice that beats in my heart and soul says simply, "Come to ME!" And my posture is for God to once again tell me, remind me, instruct me, hold me, challenge me, mold and change me! Here is what I know today to be true... God is with me, He stands Next to Me, He PROTECTS me. IN Him I am enough, and in Him I have the Victory! Failing by human standards is NOT how we are measured by Christ... By Him Alone we have Victory!!! We read this verse in Revelation 1 last week, and it is embedded in my spirit lately. I want to be etched with the GLEAN of His Brilliance! That I would stand in His presence, and draw from His love, grace, mercy, goodness, patience, and from His Mighty Voice!!! Fully knowing, and fully aware I will never be enough. There will always be thoughts, opinions, and measurements... But my heart beats differently when I think of standing, facing the radiance of my God, and coming to Him with eyes that can barely open to take even a peek at ALL He is GIVING freely to me!!! The sweetness of that Freedom, His voice, and His powerful LOVE! That is where I have the Victory! Dear Lord, Let me fail and be abounding in grace for myself. Dear Lord, help me fail and see you at the other end reminding me I am not alone. Dear Lord, there is freedom in failure! When I fail I am reminded again that I TOO need a Savior. That I am not God, and that at the end of the day it is NOT about me! Lord, help me fail today! But fail with the eyes of grace, understanding, forgiveness, and mercy for myself and others. Lord, help me to hear One Voice today. Lord, remind me where Victory is found. Lord, etch with the BEAUTY of Your Face!!! Lord, that your Brilliance is ALL I cling to, all that defines me, all I know. Lord, let me DANCE in your Brilliance and Glory!!! Remind me where the Victory is promised... and when it gets to be too much, give me a quiet space with a great bag of popcorn!!! I wrote this on the airplane yesterday as a way of explaining, in very short, the last eight weeks of my life. And while it is not perfect, it is the sweetest way I know of explaining ALL God has done, and all that I have experienced!!! Broken Sentences, mere words... I know I will write more about what I am deeply humbled and honored to do, I will write more about the story I lived this summer, the blessing to watch the God of the Universe WORK here on Earth. Today, I have a snapshot into what my last 8 weeks were at Timber Wolf Lake and my time in Virginia!!! Thank you for praying, Thank you for reading, Thank you for being in this WITH me!!! The Night that never ends... My Favorite!!! I have been gone for 8 Weeks. 2nd Session at Timber Wolf Lake, on the Program Team, and 3rd Session Speaking at TWL, and one week with my YL75 Team in Virginia!!! I have missed my bed, my friends, my family, my Snugglebears… aka Doodle Dogs (except when they were with me 3rd Session--THANK You Pizzogue!!!)! I have texted my friend JJ to ask how my flowers were doing more than 10 times… I LOVE my flowers at home! I have not made a meal in 8 Weeks! That is CRAZY! Most mornings I woke up at 6:00am. Most nights my head hit the pillow at 11:58pm. I made new lifelong friends. Dearest Ones, Besties, People who get the very simple me. Laughed more than I thought was humanly possible with strangers and friends. Cried in the very depths of my aching, broken soul with adoration and fear… both to God and to others! Wished I was different, confronted insecurity, doubt, and wounds. Celebrated joyfully, delighted in authenticity, and embraced TRUTH! To Live Forever with nothing missing, nothing broken. It went quickly, and at the same time feels like forever ago. I ate more french fries than I will admit, but loved EVERY single one. I lived in a thin place… where the edges of Heaven touch the Earth. Where what is focused on is REAL life. Life to the full. John 10:10!!! Tov Meod... the Best of the Best of the Very, Very Best!!! My Team 2nd Session... These Faces are some of my FAVORITES!!! The desire to serve and to love. That HIS Name would be lifted high. Not empty, not tired, but Fulfilled Fatigue! Other days I messed it up... Okay, most days I messed it up. Leaned into Jesus for Grace. Was quick to apologize, pray, and love harder the next time. That His MIGHTY Name would be Glorified above ALL! And through all of these moments both big and small… I have found Freedom this summer. After watching hundreds of my new high school and middle school friends step from death to life I know more than ever... There is a freedom. I am being offered Freedom. WE are given Freedom. God is extending His hand of Freedom. My goodness, how lovingly that Freedom is given by our Good God. I don’t know exactly what it all means today as I type this, but I know it. I sense it. I can see it. I am walking home different. Greeting me, as I walk back. Thank you Timber Wolf, Thank You Friends, Thank You Jesus!!! Bless His Holy Name, He IS able. I will never be the same!!! Night One, Week 2 of 3rd Session!!! God showed up and showed off as I shared about Creation inside... We are the BEST of the Best!!! The YL75 Program Team... I have learned more about myself, and what it means to trust from these Marvelous Men!!! Grosse Pointe at Crooked Creek!!! I never really thought I would be here. I remember saying Yes, but I didn't know ALL that the Yes would entail. I remember being excited, and at the very same time incredibly nervous. I remember not liking my clothes, funny, but true. I mean after all my college "outfit" was hoodies and sweatpants... I don't think I had a personal style yet! And I remember thinking I knew everything. At the same time I knew absolutely nothing at all. And could not figure out that tricky balancing act of being an "adult," but being scared all the time! On the Continental Divide with Grosse Pointe Girls!!! First Year at Wilderness!!! These were a few of my thoughts in June 2005, my first month on Young Life Staff. And now 10 Years Later. 10 Years filled with faces, names, hugs, High 5's, lots of "Hey Friend", truthful moments, honest conversations, coffee dates, texts, laughter, meals and more meals, and sports galore. 10 Years of joy, pain, uncertainty, wilderness moments, standing on mountaintops, and surprising glimpses of seeing God more. In 10 years... the schools have changed, Top 100 Music is different (but still gets so easily stuck in my head), I drink more black coffee than I used to, and still cry at EVERY pep rally I go to... they get me every single time! 10 Thoughts from the Past 10 Years on Young Life Staff!!! 1. I am Rich!!! YL Staff joke sometimes about not being in this "for the money," but friends let me tell you... I remember going to the gas station with Cheri, and looking at my ATM balance. I smiled from ear to ear, $700 was deposited in my bank account for my first month on Young Life Staff. I felt like the richest person in the world. I have realized in the last 10 years that I am so VERY rich! God provides MORE than I need every single day. And maybe not in all the ways the world would count me rich, but I am. He continues to give to me... In more ways than you have time to read, but He does. I have dear friendships, that make me feel like the luckiest person in the world! 10 years of loving friends and knowing them... Gosh, I am rich, and am living with such a sense of gratitude each day for the beauty of this life. A life filled with opportunities to watch our God work in the lives of those I love. I am Rich!!! 2. God is God. Breathe that in. I am not. Amen. I am not in control. I am deeply thankful. He knows. 3. I LOVE to Laugh. Joy is from our God, and for that I am SO grateful. I have laughed more in the past 10 years because I am around some of the FUNNIEST people in the world. I LOVE to laugh. I think I love to laugh more now than I did 10 years ago. Our God has a wild sense of humor, and I am able to see that more each day. Thankful the ministry of Young Life CELEBRATES and Laughs together! Thankful for a community of friends that encourage me to laugh more, and laugh often! HAHAHA... See I just LOVE it! 4. He Is Mine. So many things will come and go. I will fail. I have failed, and sadly it will happen again. BUT He is mine. He holds me. He shelters me. He defends me. He protects me. I have a lot to learn, but what I know... He is Mine and I am sweetly His! 5. It is an Honor. If I have ever sat on the floor of a cabin, talked truth with you, laughed, cried, and then laughed again. If I have ever cursed at you while doing the ropes course (yep, happened), danced with you, sang at the top of my lungs, watched God do a mighty work in your life, or prayed with you... It is an honor. If I have ever planned club with you, did contact work at the school, listened, shared, or leaned on you... It is an honor! An honor to be with with YOU, to know your face, to know your story. If we are not in touch now I treasure the time we WERE... (or you call me, maybe!). It is still an Honor... it is an HONOR to hold you before the Lord... an honor to treasure all those memories wrapped into the journey of 10 years!!! It is a Holy Honor to be a Young Life Leader. 6. My hair is still big. I think God likes it that way. I think middle schoolers do too! Haha, and they will always ask to touch it! This ALWAYS makes me laugh, and I whisper to the Lord, "Thank you for this funny hair!" 7. Doodle Dogs make EVERYTHING better... Yep, I just love them and love that people do too! Plus, Mason and Milo's fluffy faces make the hard days easier, and coming home MUCH more FUN!!! They have taught me unconditional love, and holding short accounts. God knew I needed two goofy, giant doodle dogs to remind me once again there is sweetness in the simple. 8. I will never do the ropes course again. I shouldn't. I won't. Fact people! But I will show up and be brave in what God asks me to do. Because I know the heart of God is FOR ME... He is for His people, His sons and daughters! 9. Being on a Young Life Camp Property makes my heart come alive. In a different way than any other place on Earth. I am closer to Shalom. I love what Matt Pogue shares at Timber Wolf Lake, "Shalom is nothing missing, nothing broken." Shalom is peace. I like Shalom. I want to live Shalom. 10. His Voice... There are so many other voices that compete for my attention each day, but HIS VOICE. I want to know His Voice louder, clearer, and more! His Voice is my foundation, my space to rest once again, and my invitation to be EXACTLY the way He has designed and created me... Made in HIS IMAGE BY HIS STRONG, Powerful, MIGHTY Voice! My desire is to cultivate a quiet heart, so that I can every moment of every day, hear that Voice louder than any other! Ah, the sweetest of HIS Voice! Novi WyldLife at Timber Wolf Lake!!! The verse my first year on staff I held strongly to was John 6:29, "Jesus answered, 'The work of God is this: to believe in the one He has sent!'" That is the work. That is it. To BELIEVE! I want to do His work, and in all things I want to believe in the ONE God sent. I want to BELIEVE in Jesus and His mighty power. I will believe more fully today. Believe in the mighty name of Jesus, and will continue to learn how to be MORE His every single day of my life. There are still hard days, but I cling to Jesus. There are still days I don't know what I am doing, and I doubt. There are days I am uncertain, and days I watch and wait. However, after 10 years, my friends... l am more in love with Our God. The past 10 years is MORE... More than I could ever ask or could have ever imagined... I could never have dreamed up the AMAZING life God has given to me!!! I rest with our God, walk with Him, and watch Him work in ALL ways. I count the life I live a rich life, a high honor, and an UTTER JOY!!! Thank you for being on this journey with me over the past 10 years, and to each of YOU... thank you for teaching me how to believe in Jesus! Program at Timber Wolf Lake!!! In the next 10 Years, I want to know Jesus. I want to believe Jesus, His promises, and His love. I want to cultivate a quiet heart. And in each new day as I learn to believe more fully, what I know is... Oh, How He LOVES Me So!!! We are HIS Tov Meod!!! My People Monday... My Mema!!! This is My Mema on the week she got engaged. This is my Grandpa Ray, I was never able to meet him. He was killed in a plane crash when my Mom was 8! I would love to have known him. The way my family remembers him, talks about him, even sometimes says his name... I know I would have liked him! I imagine what it would have been like to hear his voice, to snuggle into his chest, and to listen to his stories. I don't have that privilege, but Mema tells them with such detail I feel like in some ways I do know him. I loved reading all the posts on social media yesterday about Moms! Mother's Day is a beautiful way to sweetly say Thank You, to the one that is constant for most of us... Our Moms! Behind the scenes, clothed in spit-up, crayon flecks, and the whirlwind of dinner, schedules, bandaids, and every phone call where the voice on the other end needs to be reassured life will go on. I think of my Mema, Martha Andress, on Mother's Day. The only Grandma I have had the honor to know. My Dad's mom passed away before my parents were married. I might be biased, but I have the BEST Mom in the world, and in large part it is because of her Mom, My Mema! Fiercly independent still at 83! Mema drives. Goes to the gym. Raised 4 kids. Worked. Has a yard that could literally be in "Better Homes and Garden"! She could still be an interior decorator, always put together even for a trip to the grocery store, and has a tiny bit of a sweet tooth that makes me giggle. I spent some time in Idaho where my Mema lives this April. My sister and I were able to go for the weekend. You know it is a magical time when you lay awake at night laughing, talking, and of course getting sucked into another episode of the "Golden Girls!" Her house is a peaceful, beautiful place that begs you to come and rest for awhile! To be loved, to laugh, and to drink more coffee than I should. Time spent sitting on her back porch watching the ducks, and hearing her stories. I love listening to her stories. Stories of daily goings-on, neighbors, things that she says that always make me laugh, memories from some time ago with such detail I can see them happening, and always stories wrapped with more love than I think I will ever understand. See my Mema is a fighter. But a fighter clothed in dignity, entangled in love, and in every sense of the word she lives with courage. When I think of the call my Mema answered, I know what strength is. I can see it. It is written on her. The love of her lifetime, the pride of her 4 children and all they have done, and the way she is invested in the lives of all those she loves. Yes, she is a fighter, clothed in courage. But she fights with a heart of gold, a listening ear, and all the empathy one could muster up. I can't imagine what it must have been like when she answered the phone that morning to learn that her husband had died. In that moment her everything had radically shifted. I think of the way she heard her husband had been killed in a plane crash, (My grandpa was a pilot, and a passenger committed suicide by killing the two pilots and crashing the plane in California). Knocking at the door, neighbors and family filling the house. Looking at her children not knowing exactly what to do next, but I can tell you when she talks about it there is strength in her voice. There is Courage. And there is deep love in the midst of loss. This picture sits in her bedroom... Mema and Grandpa Ray at Halloween!!! I think of the way she realized her life had changed forever. She had 4 kids to raise. She could not drive a car, and did not have a job. Her high school sweetheart tragically killed, and now life without him. She has loved my grandpa for the last 51 years after his death. Remembers him in the most beautiful way. If I am lucky enough to fall in love, I want someone to remember me the way she speaks about my Grandpa Ray. Almost like their love has grown over the years. And yes, even though he is gone she carries him. He is there. He is with her. And she continues to love him. You can tell that by the way she recalls stories and memories, with such detail as if he is in the room and could correct her at any moment. It is a tender thing to listen to her share. Mema can recall noticing him in high school, he was the new student. She said, "He had clean elbows and clean socks." Haha, yes elbows and socks were a big deal to her. And that was it. She loved him. He moved away, and they stayed connected through letters until after college. I mean seriously, the BEST! She combines strength and beauty, with a funny sense of humor and every extension of grace to those around her. Mema is witty, wise, and yes worries, but because she truly cares. Mema knows what it means to love and to sacrifice! I have thought a lot about that lately. What is strength? The more I circle around that word, I keep thinking of my Mema's face. The picture of strength. Strength is endurance yes, but I think it is endurance disguised as love and sacrifice. That is real strength to me. Strength is to love, and to give. The fight to love and the bravery to never give up. To never stop loving and giving even when the call does not make sense and you wish you could change it. THAT is strength. When it hurts, and when all you want to do is stop fighting. BUT real strength is enduring. Real strength is giving with your whole heart, and loving when you cannot see the bigger picture. When all hope is lost, in moments you wish you could change, and in situations you never could have imagined. Strength comes in a flood of love, mustered around the courage to keep at it with unwavering FAITH that God has us! Through it all He is the one that is holding us. Our God says He will give us strength. We can snuggle into His chest, and He will once again tell us who we are. He will remind us how treasured we are, how magnificent we are created, and how He is WITH us and will give us all we need. And on those days sitting in our Heavenly Father's lap, in His presence, our weakness, our fear fades into His strength and power. We can once again walk. That is how we can give, love, and have courage when it does not make sense. WE lean into the heart of the Father. We can endure because He has first loved and given to us. I want to have strength nestled in faith like my Mema. I want to live with joy, to know deepest love, and to continue to give when it hurts the most... That is strength I see in my Mema. I marvel at her. She is beauty wrapped in perfect posture, unwavering faith, an incredible green thumb, and a deep love for those she calls hers! She continues to run, and while the pace might be a bit slower these days, she does not grow weary. Her strength has made her so very beautiful. I know what strength is because I have watched her live strength. My hero, My Mema! They will walk—never tired, never faint." I Dream At Home Depot!!! This morning I went to Home Depot. I had to buy mulch. Want to know a secret... I like Home Depot. Knowing me, it is funny I like going there, but I do. I like the way it smells, enjoy the way it is set-up, new doors next to kitchens next to paint swatches, and I love how everyone wears the orange aprons with their handwritten name in Sharpie! Great touch Home Depot! Yep, I'm a fan. When I am in Home Depot I dream about a lot of things. What my yard COULD look like. If I replaced every single light fixture in the house, what a difference it would make. I pretend I know how to remodel bathrooms, bolt things to walls, and I think pretty sincerely about buying a riding lawnmower. Seriously, how cool would that be?! In Home Depot, I feel like I can do anything. And I dream. Silly dreams, HGTV dreams, but dreams! I like Home Depot dreams! Out of a daze I said, "Owwww!" She stammered, "So Sorry, So very Sorry! I didn't see you." I laughed and told her I wasn't really paying attention... I was busy dreaming... and she said she had no business carrying that piece of wood with her through the store! We laughed about the size of the carts, and how she couldn't find her husband. "Good Luck," I said. She walked away carting the wood behind her. I stood there, and watched her. It is hard to carry things. Through this life we are each carrying so much. The weight of what we have gone through. The pressure. Expectations. The hopes of what will be, and the things we dream we could change. We are each carrying 2 x 4's around and hoping not to knock into one another. Hoping no one will notice all that we have with us... to make it out alive and not hurt anyone in the process.... sounds like sweet victory most days. I like Home Depot because I dream about all the things I would change, fix, make better... out of the store I realize I don't actually know how to do any of that stuff. BUT when I am walking those aisles installing a ceiling fan doesn't look SO challenging!? Isn't that the same with life? If I had it my way, If people would just listen, IF I could make this work, If I could erase what I said... If statements that echo in our heart and mind. If I could control it. IF I was in charge. If statements, or How, When, Why questions. My hope today is to give my statements and questions to Jesus. To give my dreams, my hopes, my deepest desires to the one that is DESIGNED to carry them. I want to give to God ALL that I hope... KNOWING He is in the business of fixing. He is the ONE who knows how to change hurt to healing. Pain to comfort. Sorrow to joy. He is the ONE who knows how to carry all these things. Give me aisles of dreams... the vision of what I want, pray for, and desire... the nuts, bolts, and 2 x 4's, but with ALL those dreams, situations, and decisions... Give me Jesus. Give me Jesus to remind me WHO I am. Give me Jesus to be there when it all crumbles, when I don't know how to make it work, and give me Jesus when it seems to sing in harmony!!! In it ALL, through it all... I want Jesus! AND the best news is... He does! He will carry it. He is right there with us. Waiting, arms outstretched to hold our dreams and our burdens. I love that about our God!!! He wants to do the heavy lifting. Today, give Jesus what you are carrying. Every single day let Jesus hold your hopes, dreams, fears, and disappointments. HE is in the business of fixing, and He will carry it all for YOU!!! I imagine his orange apron would say, "Jesus, Master-Fixer!!!" FIVE Things I Know Friday... Traveling!!! My new job takes me on many adventures, and I will say the travel has been incredibly joy-filled in this new season. That's why I have not written much this month... it has been a busy time of travel, and being gone is a new rhythm for me to tackle. I am learning, and I am absolutely loving it. The Five Things I Know Friday... Traveling! 1. I pack WAY more than I ever end up needing. Seriously, like WAY more! I don't know why, I panic when I think about only bringing one coat. I need my slippers... hotel carpets are so weird. What if someone asks me to do yoga? Or if I am asked to a hipster bash where we all have to wear flannel... What if!? However, one breakthrough, I am perfecting the airport outfit. The perfect combination of comfort, but still the elegance of not knowing WHO you might run into! Like the one time I saw Evander Holyfield in the Boise Airport... YES, I had to Google who he was when people started taking pictures of him, but STILL! 2. I am a nervous flyer... Yes, Turbulence, dings, the seatbelt sign, the Captain's voice, not being able to throw my trash away when I want... any these things will make me uneasy. My heart races, and I want to squeeze my neighbor's hand. Then I eat more Biscoff Cookies... Haha, and do some deep breathing exercises. I have found reading a funny book helps... Mindy Kaling, THANK You! BUT I like that even though I am nervous it has not stopped me. It makes me feel brave, in a small way, but brave nonetheless. 3. There is joy in the journey. I like the security line, the terminal, how easy the seat belts are to buckle, but they still want to show you how to use them. People stop to ask about my hair, sharing faith and life with new people, finding Vegan Cookies, or with TSA workers learning an extra "Thank You" goes a long way! Even when they have to wand your hair because it is so big. There is joy in sitting next to strangers... OR in a row by yourself!!! There is joy in this journey, and with eyes open, ready for what God has... I have loved the journey! I wait to see where God is, what He has, and what we will be doing together. I love that about the journey. Row to myself... Woo Hoo!!! 4. I will forever be mad at the Rental Car places that think I don't know what I am doing. Seriously, fill up the tank for me? Buy more insurance? A GPS??? I know there is a way you make more money in this... I just can't figure out what it is! Lets just be honest with one another... Come on... We will both feel better. 5. I always miss home! I like this the best. I love where I am when I am there. Practicing being fully present. I celebrate new places, familiar faces, new friends, different neighborhoods, adventures, my job, but home. Home is where my heart can rest again in knowing where Trader Joes is located, my favorite Starbucks, my friends and fam jam, and I can see the Snuggle Boo Bear Boys. I like home. I love home. I like this best of all about travel. God has shown me the home I share, the place I live... it is best of all. It is where I come to rest before I pack again. Routine, walks, the Target I know the lay out to, how to work my coffee pot... all parts of home I treasure. That is something to celebrate this Friday afternoon... that we would be content at the place He gives us to rest and return to Him... the sweetness of home and the wonder of all things familiar!!! There is goodness found here. Today I am aware of so many people who are dealing with physical health problems... So many friends who have shared what is going on with them enduring illness, questions, concerns, and more tests. Actually, right now I have friend who is, at this very moment, in surgery to remove a tumor in his brain. I am praying. I will continue to keep praying. I sat with the Lord yesterday and He wrote this to me... It has been a Great Comfort! "My dear girl... I am here! Don't you see--I have given ALL to you! Rest in me this day. Believe I have the very Best for you on this day and ALL days! I am soooo deeply in love with you and I am proud of you... Love me-- and sweet girl TRUST me more today! I have good. I want good. I know you! I love you! HEAR THAT TODAY... Utter Love for YOU!!!" Today I will believe this about all my friends dealing with illness. God has given us ALL. God IS giving us all! Illness is scary. Illness is huge amounts of uncertainty! It is worse case scenarios, mixed with anxiety, and immense fear when there are not answers. Strength is fleeting when hard news comes. Deep breaths, and statements about waiting. God is dearly loving us! I know that does not take physical pain away, but what I do know is that our God wants to free us from the anxiety and fear that comes with uncertainty! Today, in all ways, lets call out to Him and watch God rescue us from ALL that makes us fearful! Lets nestle into the chest of our Savior, and continue to pray boldly for physical healing from our Great Physician!!! My 240!!! Justin is on the right holding sweet Dom Dom!!! Please pray for Justin, Krista, and their two Boys Dominic and Xavier! I will look for Him with GREAT hope! He is here. He will RESCUE us from fear!!! You might call me a crazy dog lady. You could in fact be right about that depending on your definition. My definition changed when my Mom and I went to a dog show in January, and I realized there is a whole other level of dog ownership when it comes to the dog show world! If you see me purchase a blazer, and practice running circles at a slow, controlled pace, you know I am entering this new level of dog mom commitment. At the Emergency Vet last night! I have had a big week with the Doodle Dogs. Last Monday morning Mason had a fatty tumor removed on this stomach, and had his teeth cleaned (they thought one tooth was fractured, but it turned out to be fairly small and he was able to keep his tooth). Dropping him off on Monday morning I cried. I worried. I asked questions. I prayed. And even last night at the Emergency Vet, I trusted. Tears... yes. But Trust. Sweet surrender to the one I trust. Mason's stitches had popped open yesterday evening. I panicked, but I have some of the best friends in the whole world. So while I got things ready to go, thinking the worst, they bandaged him, and put a tshirt on the pup! I called my mom on the way there... she has a way of hearing me that is good for my heart to calm down and take a breath. We got to the Emergency Vet, and while we waited in our room, I whispered in his ear he was brave. He looked up with his big brown eyes, and I told him I was there. I asked more questions than I am sure the nurse wanted to answer. I mean stitches are already so gross, but stitches that pop open are a whole other level of messy. Gaaaross! As I sat on the floor with my Big Hearted Doodle Dog, I realized I hate not knowing. I hate not having answers. I don't know how to help. And with dogs, you almost always just don't know. How does he feel? What does he need? Sitting with Mason on the floor of the Emergency Vet! 1. The truth I learned when I first started to follow Jesus is STILL truth! In so many ways I have matured in my faith, thanks be to God, but in so many ways I am still the same 16 year old. "Lord, prepare me to be a Sanctuary" is a strange song to start singing sitting on the floor of an Emergency Vet, but I remember I loved that song. I love the image of God making me into what He wants. Lord prepare me to be a dwelling place for you. You are with me. I am hidden in Christ, in the shadow of your mighty wings. Tried and True. These truths will never grow old. Foundation. Truth. I still cling to that promise. will be safe in the shadow of the Almighty." 2. God is mysterious, and sometimes that is scary, but He is ALWAYS good! I will be SAFE with Him. There is comfort and peace when my heart begins to break. When I want to know, and don't have answers. He is good. He is always good. AND He has answers. He knows. 3. I want to exalt the Lord when it does not make sense! He dwells where He is welcomed. I want to exalt the Lord, welcome Him, and sit with God! That my posture would always be to welcome the Lord with total surrender and praise! Even in the midst of hard situations. My soul would exalt the Lord in all ways, at all times... because He is control and I can trust that. For many of you today I would imagine there are many more things that are keeping you up at night. There is much more that is worrying you. That weighs heavy on you. There is much more that feels messy and gross. Lets go to the throne of grace and mercy together. Lets approach our God with awe, wonder, and total trust! He is Good. He is Loving. He is with us. And remembers us. I want to hear it will be okay, and I want to know. But more than anything I want to trust God with what I treasure knowing He Is Good... even if it feels messy. This Doodle Giant LOVES being outside... short summer cut hair! "God, you are my God. I celebrate you. I praise you. well-thought-out plans, solid and sure." A lot of people have said this to me about my job transition, "Why the change???" In Fact, I have spoken with friends even in the past few days, and they will comment on what a great fit this new role is for me!!! I mean really... I am thankful and GRATEFUL each day for my job, my life, and ALL God is doing. Yesterday was Young Life's Day of Prayer... and I shouted to the Lord... "THANK YOU GOD!!!!! I Loooove THIS!!!!!!" Yep, in my house just SHOUTED to God, and probably scared the Doodle Dogs! My sweet friend Devaney at Capernaum Club in January!!! She's the BEST!!! I met Jesus through Young Life in 2000 at Rockbridge, a Young Life Camp in Virginia, and have been on YL Staff now for almost 10 years... June 10th is my 10 Year Anniversary... YIKES! I really Can't BELIEVE It! The Lord has radically changed my story through Young Life! When I accepted Jesus I said to my Young Life Leader, (who is now my Boss, haha), “I am smiling from the inside out for the first time!” AND I have a pretty big smile!!! About 4-5 years ago I knew the Lord was stirring something new in me. It would be a challenge, a new journey together, and a different story than I had been living on Young Life Staff. I felt as though I was walking with the Lord into something deeper, but I could not exactly put a name to my desire and calling! As I look back, I stand in awe of WHO God is. I wake up each morning deeply thankful for what God alone has done, and through the mission of Young Life, am honored to do what I am called to with the King of Kings here on Earth! God was asking me to work with friends with disabilities! I knew it... I had a sense that this was a population of people the Lord was asking me to be with, to love, to learn from, and to share Jesus with! I spoke my hope, prayer, goals and dreams to a few people... but the Lord had other plans!!! OUR plans are not always HIS - sometimes His are so much more. It has been a longer road to get here than I thought it would be, but God is faithful and on the move!!! I thought it would be Young Life Capernaum in Novi, my former area, but little did I know God wanted it to be all over Metro Detroit... Available to students in Livonia, Farmington, Novi, Canton, and Walled Lake!!! Places we don’t even have typical Young Life yet! We are partnered very closely with my church, Ward, who has a wonderful place for Capernaum friends to graduate into called Potter's Wheel. Along with starting Metro Detroit Capernaum, I am honored to meet with new areas who want to start Young Life in the Eastern Great Lakes Region. I was sitting in a room full of adults in Northville, Michigan, a month ago and one of the parents had given their life to Jesus at Windy Gap when they were in high school! They had been praying for Young Life to be close by, and could not believe we were re-starting Young Life in Northville! She started to talk about Young Life Camp, and I immediately welled with tears… Our God is big! Big enough to care about the very fabric of our hopes and dreams! On Program with my good friend Jake!!! It was one of the BEST Weekends at Timber Wolf!!! The last part of my new job involves speaking/program that are tied into my budget…. something I could never have imagined! This addition has allowed me to live into the way the Lord has designed and created me in a very authentic way! I am able to attend banquets, weekends, church retreats, and other events around Michigan and the country… to see the heart of Mission face to face, and to share the Good News of WHO our God is and can be!!! I love speaking about Jesus, and laughing! My very soul is alive in these tender moments! There are so many stories that belong to the lives of kids, adults, and families, and I get to watch the very hand of God move in a mighty way!!! I will share a moment from Capernaum Club in January. Kailey, a Capernaum Friend, who I have known for almost two years stood up at the end of our Club Talk. The question was, “What makes you special?” Kailey stood and said, “I just feel like no one understands me. But I know God does. I know He does, and that’s okay! It makes me special that He understands!” Yes, yes it does! Our Capernaum friends are so real, vulnerable and honest. I breathe in a different way around these friends, and their faces speak of such truth! Is there brokenness? Yes. But Good News is GOOD News to ALL people! My friends feel understood, valued, and known! What more could I ask for from our sweet Savior!!! I am living a deeply understood story. Our God DOES know us, and my goodness how special that does make us!!! I did not know exactly how God would make it possible, but just that He would do it. I am walking in a different way during this season of ministry. I can trust our God! I think I always knew that, but I trust Him in a completely different way! We can trust Him with our dreams, with our pain, and with our deepest hopes too!!! AND more than anything… We can be BRAVE with Our God! In May I was scared, nervous, and fearful about this position in Young Life. I was sad about leaving Novi Young Life, and that continues to be a process. I questioned everything from raising $115,000, to where we would even meet Capernaum friends, how to start new Areas, where would God ask me to speak… There were so many unknowns, what ifs, and hard moments of trust. This morning I am walking with a FULL heart! I am walking with absolute JOY, and a deep sense of gratitude... I am walking in the wake of HOW BIG our God is!!! I love this ministry, but my goodness I LOVE our God!!! Smiling from the inside out… Utter JOY in Christ Alone 15 years later!!! WHY the change??? Because I am walking hand in hand with our God… living a FAR bigger story than I knew was possible! Praise To OUR God!!! Why the change for You... WHERE is God asking you to walk with Him more intimately??? This is my friend Rachel! 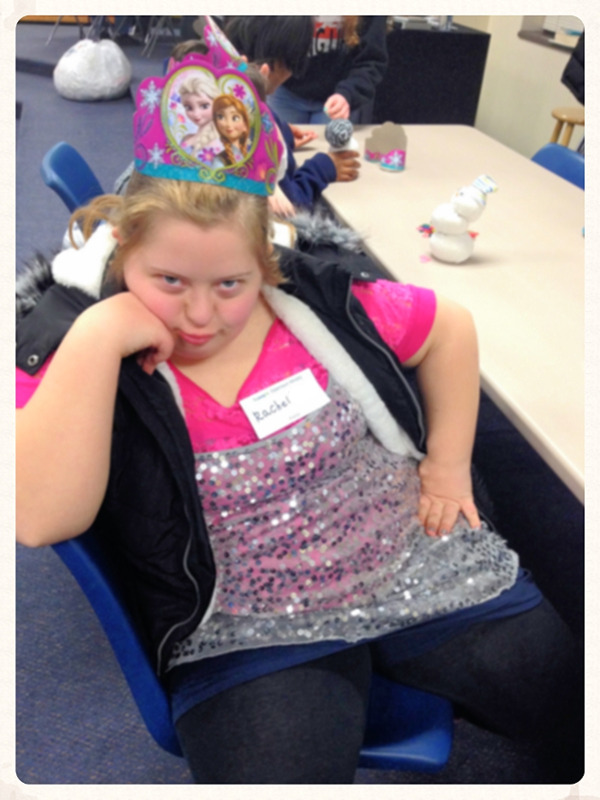 Rachel comes to Capernaum Club on Thursday Nights! Young Life Capernaum is a ministry for high school students through age 26 who have disabilities. We started Metro Detroit Capernaum in December, and work closely with Ward Church! Rachel has been to the last two clubs, but I can already tell you she is a funny, wonderful, sweet and sassy girl! Our leader Lauren sent me this picture of Rachel, and I love it! Perfectly her! Sherry, a Capernaum Leader and Director of Special Needs Ministry at Ward, knows Rachel from school. The first night Rachel came to Capernaum Club I introduced myself and asked Rachel what she likes to do. Very quickly she responded with, “I LOVE singing and dancing!” And then she gave me this big smile, and a little wink while she turned to check out the room. I said, “You will LOVE Capernaum then!" From 6:30-7:00 at Capernaum Club we have hang out time… our friends can do a craft, play games, eat a snack, and now they can dance! I turned up some music for Rachel, and asked if she liked the song? "Love Is An Open Door" seemed like a good tune, seeing as it was our Frozen themed club! Rachel just started dancing! In a room full of leaders, buddies, parents and peers, Rachel busted out her dance moves in her amazing glitter shirt! I couldn't believe it, and I couldn't take my eyes off of her. She danced for 20 minutes. Danced in a room full of people with a smile full of confidence! Watching Rachel, I pushed back tears. Yes, that room was a place she felt comfortable right away, and I hope felt automatically loved, welcomed, and celebrated, but honestly that is not why my eyes were welling up. Watching Rachel was a beautiful lesson in letting go. Honestly for me, and I would imagine for many of us, everyday is a battle with the thoughts of others in the back of my mind. My actions, decisions, words, and choices on display for others to see. People can be harsh, critical and opinionated. I am sensitive and care way too much what others will think! Will they critique, make fun of me, judge and deem who I am as good or bad? I know that is not the way I should be thinking, especially at 31, but it is hard for me to let those voices go. To set that wondering down, and live authentically as me! Will they think I have it all together? I wish I was brave like Rachel… courageous to do what makes me feel authentically me without thinking about how others might see me. I admire Rachel, and the ability she has to be uniquely herself. I am constantly striving to become that version of myself, but what does that look like with these voices nudging my decisions, choices, and actions? Second guessing who I am, what I have done, or will do. And on days when the wondering becomes consuming, I can easily feel stuck. I think being authentically me looks like dancing. It looks like my new friend Rachel!!! There is joy in watching Rachel dance, but I think that is how God feels about each of us when we live into our story. When we live into our own gifts, talents, things we like that gives us energy and life… God cheers us on! He is captivated by the authenticity that He has created in EACH of us. He is captured with us exactly was we are, and made to be! And I think He cheers us on even louder when we ignore the thoughts, feelings, and wonderings of how others might see us and we just dance! Because in the end we are, each of us, loved by the King of Kings... Called by name by our Father who wants us to dance as DEARLY loved sons and daughters! This is who we are. I want to be Bravely Me! I want to dance in a crowded room, and know my identity and value is in Jesus! I want to stop second guessing if I am good enough, and trust God is cheering me on! Will you be brave with me today? In all we do, lets dance like Rachel! My friend Sarah told me Starbucks had Coconut Milk... I had to investigate! Yahoo! I am thankful for more things than I could ever attempt to write down. I feel entangled with thoughts and to-do's. I wish I was different. I try to be bold. I want to change a few things. I want the temperature to be above 1 degree. I see Jesus in people today. I am fearful of new things. I breathe you in God. I am Loved... Just as I am today. And today that is simply enough!!! "For I have every confidence that nothing—not death, life, heavenly messengers, dark spirits, the present, the future, spiritual powers, height, depth, nor any created thing—can come between us and the love of God revealed in the Anointed, Jesus our Lord." I'm Not Receiving Flowers Tomorrow!!! I have had many moments to think about the fact that tomorrow marks a day for people in relationships. It is a day to go to dinner, to drink fancy drinks that clink together as you say, "To Us!" (Or at least in my imagination that is what people say to one another!) A day to receive candy, cards, flowers, and other sweet sentiments that say, "I love you!" My personal favorite is the stuffed animals that hold the tiny balloons... there is something about tiny balloons that I find extra cute! I remember one special Valentine's Day was with my 7th Grade boyfriend. John, was the new love of my life and we had been going out for about a week! Perfect timing, I had a Valentine! I couldn't sleep the night before knowing what happens on Valentine's Day at school when you have a boyfriend... GIFTS and CANDYGRAMS. I met John at my locker that morning, and was given a few Valentine gifts, and then in each class waited to see if I would be given a CandyGram. The joy on my face... Oh my goodness if I could have seen what I looked like that day! And I carried a red, polka dot, stuffed bear around all day with such pride and excitement knowing people would really SEE I had a Valentine! I was practically advertising it, and I loved that! I am someone to someone today! We all want that feeling. To know that there is someone who declares WE are special. And especially on February 14th says, "Be Mine!" While this year feels like most years... The absence of that clinking, the absence of tiny balloon holding animals, and the absence of flowers arriving at the door I am more certain of one thing. I do not feel that absence as I look to tomorrow. Not because I have some magical fix, or stopped caring I was single. But for those who are sitting in the same... Reservation for One on this Valentine's Day... would you believe there is someone who thinks you are someone to them! He whispers each day to you and me, "Be Mine!" On a special day, where you might dwell on the fact that flowers are not arriving on your door step, YOU are more treasured than you could EVER KNOW! There is someone that sweetly whispers each day, "I LOVE YOU!" Who stands and declares every morning that you are His... Who wants to fill the absence with incredible belonging. I mean we are so loved that He has made thousands of different flowers for us to gaze upon... (now obviously if you live in the MidWest or East those flowers are under snow, BUT can be found at your local grocery store because they are not growing in what my car said was -4 outside today!!!) Haha, but our God is so creative with even that... How much detail He put into designing different types of flowers for us to enjoy. If the God of the Universe went to all that trouble... My goodness, we are soooo loved! On a day where you might feel excluded or more alone than other days... where the absence is all to familiar for you... lets rewrite how we celebrate Valentine's Day! PLEASE know you are INCLUDED and INVITED by the God of the Universe! AND here is the wonderful way God lets us participate in LOVE on this holiday... True, we might not have a Specific SIGNIFICANT other BUT my goodness you have significant OTHERS all around YOU! Make a list... Friends, Family, Co-Workers, Neighbors. Lets participate in love in a passion filled, abounding way on Valentine's Day! Reach out to the widow next door, the dearest friends you have, parents who have stood by you, college roommates you haven't seen in months or years, the sister or brother that has loved you through ALL your mess! I mean seriously... God STILL lets us participate in this holiday, but we get to be creative with HOW we give our love away! Lets LOVE extravagantly BECAUSE we are loved extravagantly! By the clinking of our glasses declare on Valentine's Day, "Here's to Us being LOVE in the World!" Loving others in this broken, junky, beautiful world also reminds us how dearly loved we truly are! Loved in a courageous, never ending, unconditional, special, bold, and unmatched way! We ARE Loved! And I will spend my whole life trying to understand this mysterious love that heals, restores, and makes me whole! Say goodbye to the absence, and welcome the belonging! Then lets give our love away to those around us!!! The sentiments tomorrow are sweet, and even though I will not be receiving flowers, I am loved because God simply says it is so!!! Who wouldn't want to celebrate a day where we rejoice in being loved! Soooo Reservation for One Friends... Lets love passionately, with extravagant love, because He First has LOVED Us! Because we Belong to Him! BELIEVE You are Loved Today... Tiny balloon animal in hand or not, and YOU have love to give away!!! My People Monday... Officer Steve and Reese Witherspoon!!! Yep, I have NEW Friends... Officer Steve and Reese Witherspoon! She was wearing a pink sweater trotting along the road when I noticed her! Sweet Reese... "Where are your owners?" I said to myself inside my car leaving Holland, Michigan, where I was speaking a Women's Retreat Saturday! I had been gone from home for about 3 1/2 weeks leading up to this, so needless to say I was SOOO happy to be getting back to HOME on Saturday!!! Well, plans changed when I saw this face! I immediately noticed that this tiny, pink sweater wearing Chihuahua was walking on the sidewalk by herself. I parked the car in the middle of the road when I realized something had to be done. A bus honked at me, and cars drove right past, but the last thing I wanted was to see this tiny pup be hit by a car! I motioned for them to go around as I called to her. She jumped onto the railroad tracks and started running! "Gosh, Come ON!" I yelled. But she ran faster, and I chased her! As I ran down railroad tracks, I quickly realized that my car was still running! I was wearing a dress, blazer, and brown (NON) winter boots from speaking that morning/afternoon! I must have looked crazy clapping my hands, and yelling for her! I ran back to my car, jumped in and followed her down the tracks. I parked my car behind a Vacuum Cleaner Store that was closed, and walked in thigh high snow to her... she continued to run into the woods along a stream near the Hope College Soccer Fields! The smallest pup, who is literally the size of Mason and Milo's face, was shivering, soooo very skinny, and clearly scared. I could not get that close as she continued to snarl at me with each step I took. I have never been bitten by a dog, but I did not want that to happen by a stray dog wearing a pink sweater! I ran back to my car to turn it off, grab a towel, my phone, and a granola bar. As I walked back she snarled again. I decided pretty quickly we needed to become friends if this was going to work out! So what better way to be friends with someone than to name them! The only thing I could think of was Hope (obvi), Mabel (ya know in case I brought her home she needed an M name), and the dog from Legally Blonde! Haha, Reese Witherspoon it is! I called the Humane Society, and they directed me to Animal Control. They said they would send someone out to help because we were by the railroad tracks... Hooray! I told them I could not pick her up because I thought she might bite me, and about how I decided in order for anyone to get her we had to be friends. The dispatcher responded with, "Good Luck!" Haha! I sat there... In the snow... and told Reese about my life! I told her about Mason and Milo, and how much I missed them! I told her I knew she was missed. I broke apart the granola bar, and at first as I threw them her direction she looked uninterested... until she started to smell the peanuts. It was then she warmed up, and began to eat. I still had to keep my distance because any time I would get a little closer she would snarl. I sat in the snow, in a dress, for about 45 minutes to an hour. We waited for help together! Still unsure of me... We sat here! The Officer pulled back around, and called to me when he got out of his car, "You must really love dogs!" Haha, UNDERSTATEMENT of the Century Sir!!! "What is your name?" I asked as he got closer. "Do you like dogs Officer Steve?" I asked. "Oh yeah, I have had a hard morning so I am happy to be helping her!" he responded. I realized something as I sat in the snow, working with Officer Steve, and befriending tiny Reese Witherspoon... Something I think I knew, but know more now by the look that began to change on her face over that time. We are all afraid of something. We all want to give up. We run away from what could be the best for us because it is scary to trust! BUT our God does not walk away from us. He sits in snow. He sits in our pain. He will chase us, run after us, feed us, and try as hard as He can to love us. And while we snarl, and hide our God waits. Believe today that our God is sitting WITH you in whatever is going on. And He will feed you with warmth and love... tiny pieces of granola bars until you are ready to accept His offer... until you are ready to trust! Being held in love is so much MORE warm than wandering in the cold in our own tiny pink sweaters! Let our God hold you today! Wrap you in His love, and calm your deepest fears... YOU can trust Him! Officer Steve and Reese Witherspoon all wrapped up! The Beauty of Trust! Officer Steve finally got the towel around her, stroked her face gently with his gloves, and picked up tiny Reese! HE said, "I just don't want her to bite me in the face!" Haha, my thoughts exactly Officer Steve! But he was holding her, and we walked out of the snow together... All three of us! He put her in the back of his car and wrapped his jacket around her! Officer Steve sweetly asked if I wanted my towel back, but Reese was all wrapped into it! I said, "No that's okay! She can have it." I put my other boots on, and drove home with a warm heart and freezing feet! Grateful to witness the beauty of trust on a snowy Saturday with Reese Witherspoon and Officer Steve!